This is one of those rare dishes that I always have the ingredients for on-hand without actually planning for it. I love this recipe. I take zero credit for it, it’s Lisa Leake, from 100 Days of Real Food, again. Pie crust is one of the things I always bought rolled up in a package. But one of those things that I will not buy anymore. This pie crust is ridiculously easy to make. Its 4 ingredients, you dump them in your pie dish, mix with a fork and shape the dough into your dish. Done. 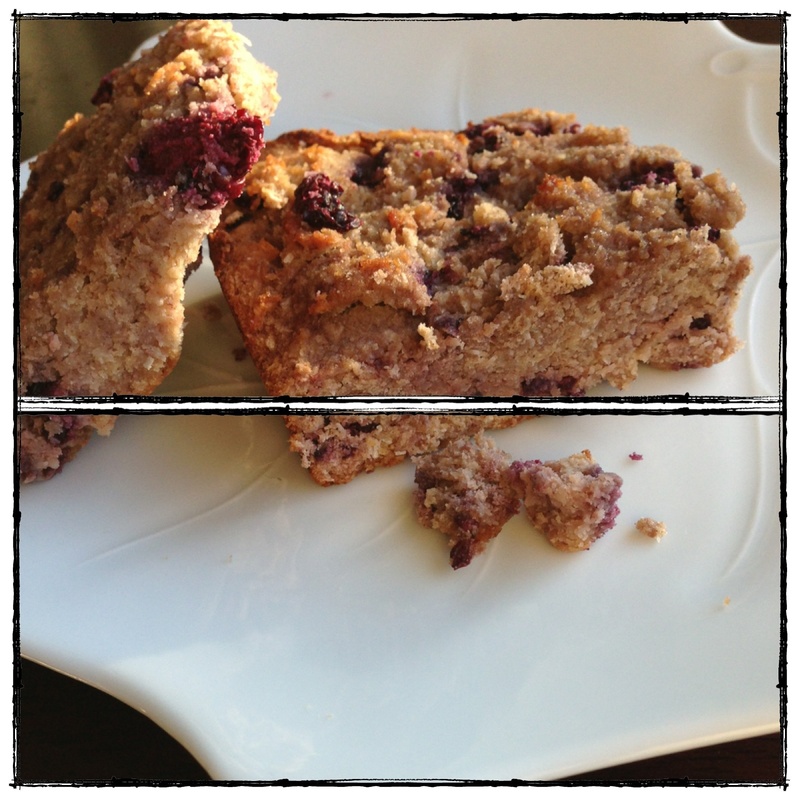 The first time I made it, I just knew it wouldn’t taste good because of how easy it was – I was wrong. Now, it’s a go-to. And it freezes well*. 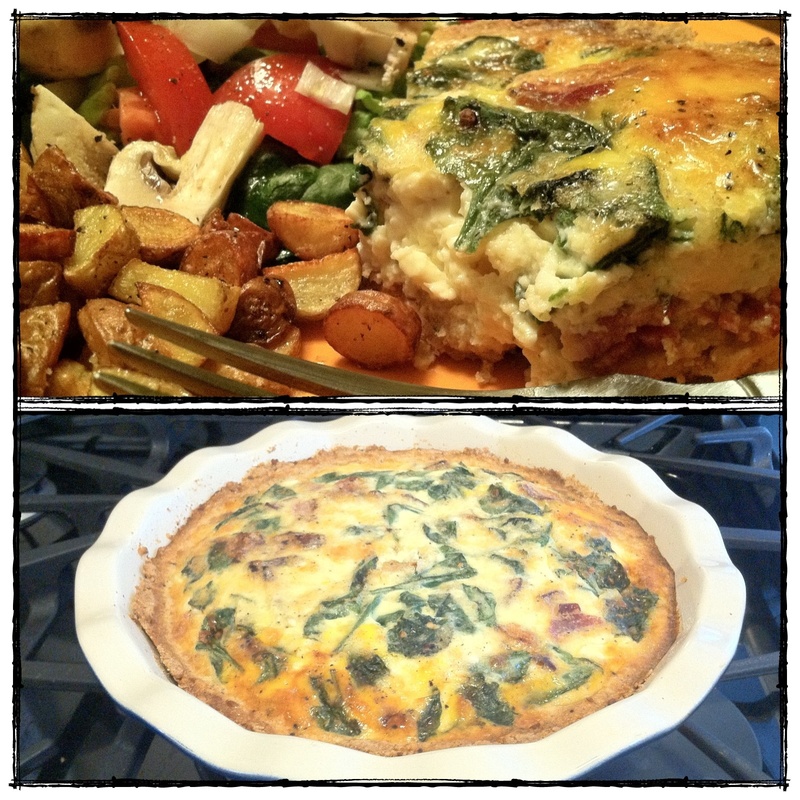 Today I filled ours with farmers’ market bacon, sautéed spinach, and goat cheese. After cooking the bacon, I poured out the majority of the grease and threw about 4 big handfuls of baby spinach in the same pan and sautéed it in the remaining bacon grease until wilted. I let that cool, crumbled the bacon tossed it and the spinach into the egg mixture and topped it off with a sprinkle of salt, pepper and parmesan. It was yummy. Quiche ingredients of your choice! Our favorite add-ins are: farmer’s market bacon, goat cheese, cheddar cheese, garlic, sautéed spinach, sautéed mushrooms, roasted red peppers, grated zucchini or squash. 2. In a pie dish, mix the flour and salt, then pour in the milk and butter and stir everything together with a fork. 3. Once your ingredients are mixed, I find it easiest to make a ball of dough and just flatten it with your hands to fit the pie dish, working it gently up the sides of the dish and crimping the edges with your finger or a fork. Definitely the easiest way I have ever made a pie crust! 4. Whisk together the milk, eggs, salt, pepper and then pour into crust. Add your favorite additional ingredients to the dish and top with extra salt and pepper and parmesan cheese. 5. 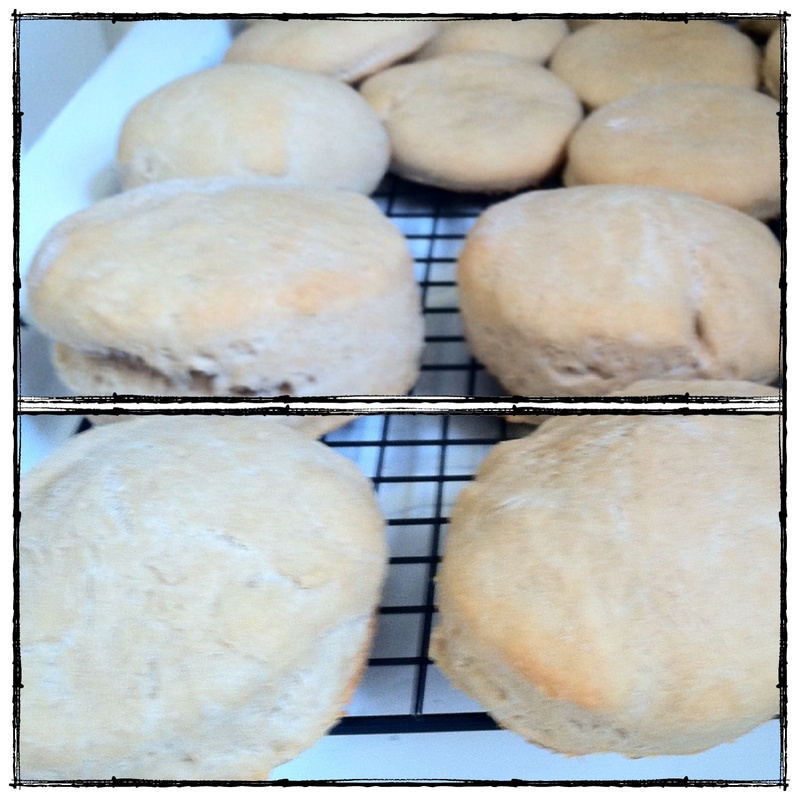 Bake for 30 – 40 minutes, or until filling is set. *This is a great dish to freeze! Sometimes I will make two at a time, bake them both with the intention of freezing one and saving it for a busy night or a weekend breakfast. Once you’ve baked it though, make sure you let it cool completely before putting it in the freezer. It should be thawed before re-heating. Just pull it out of the freezer the night before you want to eat it, let it thaw in the fridge overnight and bake at 375 for 30-40 mins, you might want to put foil around the crust edges though to be sure they don’t burn. Macaroni and cheese is one of those foods that I can totally go overboard on. (Meaning: I have no self-control when it comes to macaroni and cheese.) My neighbor Kelly makes the yummiest homemade mac and cheese with jalapenos and bacon. I knew my kids wouldn’t touch it if it were spicy so I omitted the jalapenos and added cauliflower. Maybe cauliflower is a strange thing to add, but it’s white, it blends in, it’s delicious smothered in cheese – and I thought I could trick my kids into eating hidden veggies. Yep. That’s why. It was delicious. If you’re a mac and cheese enthusiast like me, I strongly suggest you try it, too! 2. Steam your cauliflower until tender, and set aside to cool. While cauliflower is steaming, cook your bacon slices. Once cooked, crumble bacon and set aside. 3. Melt the butter in a sauté pan over medium heat add your garlic and cook until browned. 4. Whisk in the flour and continue stirring for 1 – 2 minutes until the roux (which is equal parts flour and butter or oil) starts to darken. Be careful not to let the roux burn. 5. Add the milk to the pan on low heat, stirring continuously. Turn the heat back up to medium and keep whisking until the mixture starts thickening and all lumps of flour are dissolved. 6. 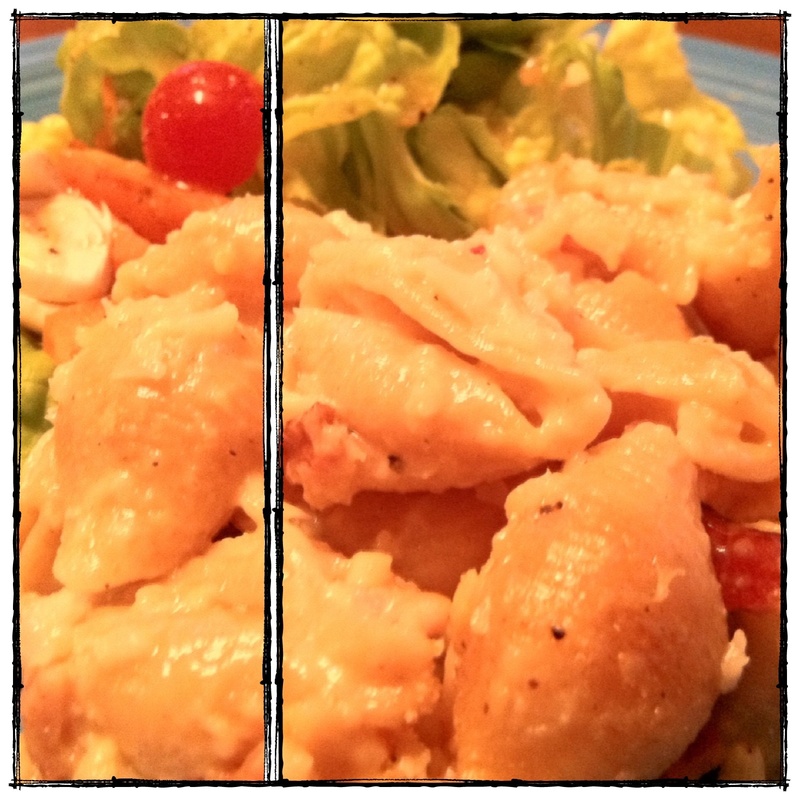 Stir in the grated cheese until melted, then mix in the cooked noodles, steamed cauliflower and bacon. Season with salt, pepper, and red pepper flakes. 7. Dump everything into an 8 x 10 baking dish, sprinkle with extra grated cheese and whole wheat breadcrumbs (optional) and bake until the top starts browning (about 30 minutes). 8. Serve while nice and hot! store-bought strawberry ice cream… recently, my 3-year-old daughter refused to eat store-bought strawberry ice cream that was offered to her at a friend’s house because it was “too pink”… I couldn’t agree with her more. 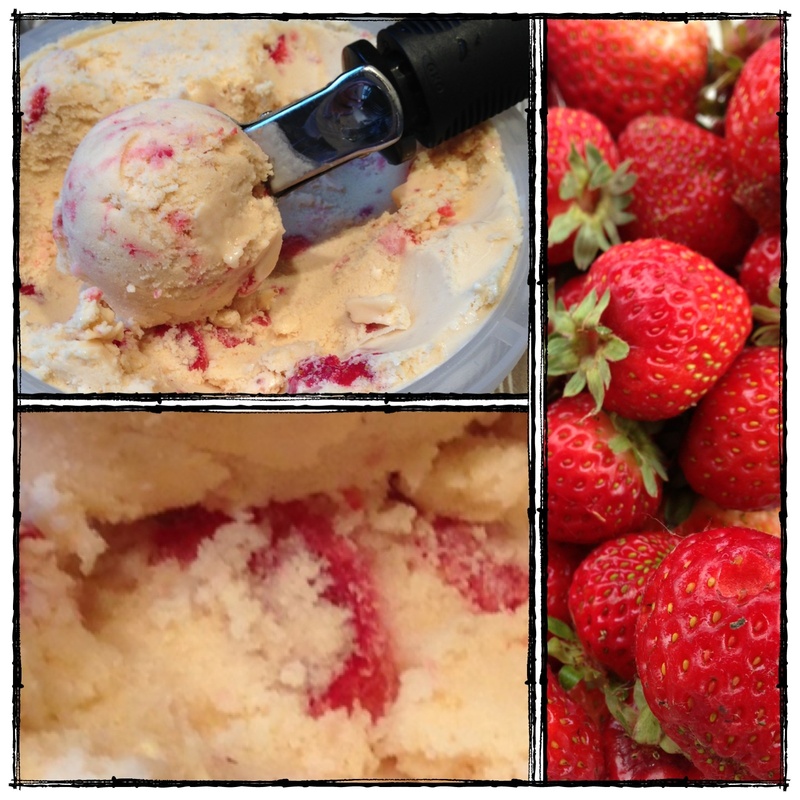 Skip the artificially flavored, artificially colored strawberry ice creams and make your own! Even if you only have it during the summer months when strawberries are in season, it will be well worth the wait. Or, do what we did and freeze those strawberries so you have some to use during the winter months. So happy we don’t have to go an entire year before we make this ice cream again! 1. Pour cream into a large bowl and set a strainer on top of it. Set aside. 2. Combine milk and syrup in a saucepan and warm over medium heat for 2 minutes. 3. SLOWLY pour warm milk mixture into separate bowl containing egg yolks, stirring constantly. Continue until all the milk mixture is added to the eggs. This is called tempering your eggs. 4. Scrape egg/milk mixture back into saucepan and cook over medium heat until custard begins to form, again stirring constantly. It’s fairly obvious to tell when the mixture is thick enough…. the back of your spatula will be coated with the mixture when it’s ready. Don’t over cook this, or you’ll end up scrambling your eggs. 5. Pour egg/milk mixture through the strainer and into the cream. The strainer should catch any egg that cooked…. I usually end up with a tablespoon or so of egg in my strainer. 6. Add the strawberries, and stir to combine. 7. Stir, cover, and chill the mixture in the refrigerator for at least 4 hours. Then, make the ice cream according to your machines’ instruction. Oh holy crap. 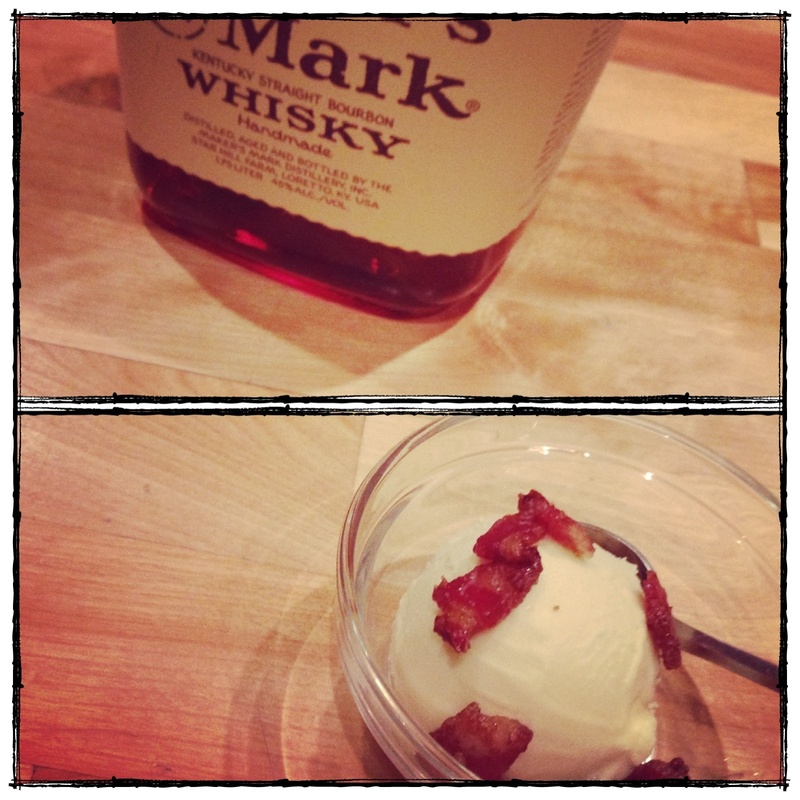 If you like whiskey, this is the best ice cream you’ll ever taste. No, seriously. It’s that good. Thanks to my friend Trixie for the inspiration. And to my husband for developing my love of whiskey. 6. Add the whiskey. I started with 1/8 cup, but I will admit I added more after tasting. Just another splash. We like our whiskey. 8. I added candied bacon as a topping. To candy the bacon, cut a few strips of cooked, organic, pastured bacon and throw them in a skillet with some brown sugar. I almost never use brown sugar, but decided to splurge today. Cook over medium-high heat until the brown sugar melts and coats the bacon. Transfer immediately to parchment paper to cool. Once cool, crumble and spoon onto ice cream.